Good Samaritans saved the life of a Sicklerville man after a crash set his car on fire. The driver is in serious, but stable, condition. A Sicklerville man is in serious, but stable, condition after good Samaritans rescued him from his burning vehicle Friday. Tyrone Gollopp Jr. 20, was heading East on Erial Road in Winslow Township. As the vehicle approached Eden Hollow Lane, it lost control. 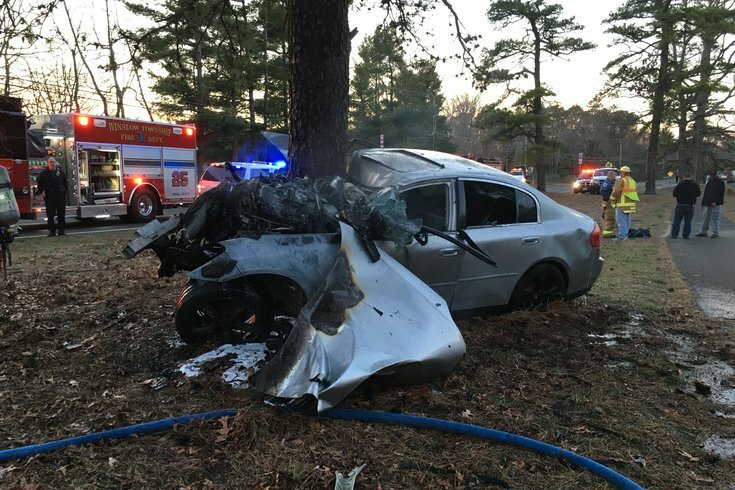 The car veered left and entered the Camden County Park Recreational Area, striking a large pine tree. The collision started a fire, with the driver trapped inside. Several people who witnessed the crash assisted. They pulled Gollop to safety, away from the burning car. Gollopp was transported by Winslow Township Emergency Medical Services to a medivac helicopter. He was transported to Cooper University Hospital in Camden with serious injuries.